When Mick Cronin’s body decided to call a timeout last season, no one was prepared for it—not his team, not the fans, and least of all Cronin himself. But after a few months of rest and forced relaxation, the University of Cincinnati men’s basketball coach is back on the bench. And he still only knows one speed. It was a few days before Thanksgiving 2014, and raining just about biblical—the kind of rain that transforms a bustling college campus into a scene from an old John Wayne western, damp leaves flowing down abandoned sidewalks like tumbleweeds across an empty prairie. Despite knowing my way around the University of Cincinnati, and the fact that my apartment was only a few hundred yards away, I was dripping wet when I walked into Mick Cronin’s office on the sixth floor of the Richard E. Lindner Center—just steps away from the Oscar Robertson statue—to interview him about the season at hand. It took a moment for me to register the state Cronin was in, but I quickly realized it was not good. His face was wearing stress as only a coach’s can, every flawed play and mistake weighing heavier in the bags below his eyes. His head, the very thing that would soon send the school and the Cincinnati Bearcats men’s basketball program into a panic, appeared to be causing him serious pain. He could not stop rubbing his temples as he strained to stay in the conversation. In a word, he looked like hell. It was an arterial dissection, a vascular condition that forced him to miss the final three-and-a-half months of the 2014–2015 season. Now, less than a year later, he’s medically cleared and back in place as head coach, fresh off a late-summer vacation out west that allowed him a few days to recuperate in peace. Attired in a white Under Armour polo from UC’s new outfitter, Cronin is gleaming—not quite tan, but about as close as the Irish skin of a life-long gym rat will allow. No doubt. But after a season steeped in uncertainty, one thing is immensely clear: Mick Cronin no longer looks like hell. “I kinda forgot about all that,” says Cronin. This placid retelling is a far cry from the angst that engulfed the team, the university, and some quadrants of the city in the wake of the initial diagnosis. According to Cronin, there were no symptoms or signs that anything was wrong until halftime of UC’s 56–55 double-overtime loss to Nebraska on December 13 last year, when he began to suffer from crippling headaches. Even with the two teams combining for more fouls (42) than field goals (36), he quickly realized he was experiencing something more extreme than his usual stresses, and gave himself a three-day deadline for things to improve. Instead they only worsened, and following a 71–62 overtime victory against 19th-ranked San Diego State on December 17, Cronin went to the UC Medical Center for a CAT scan. That’s when he discovered he had an arterial issue in his brain, though he was not yet fully aware of its exact specifications. 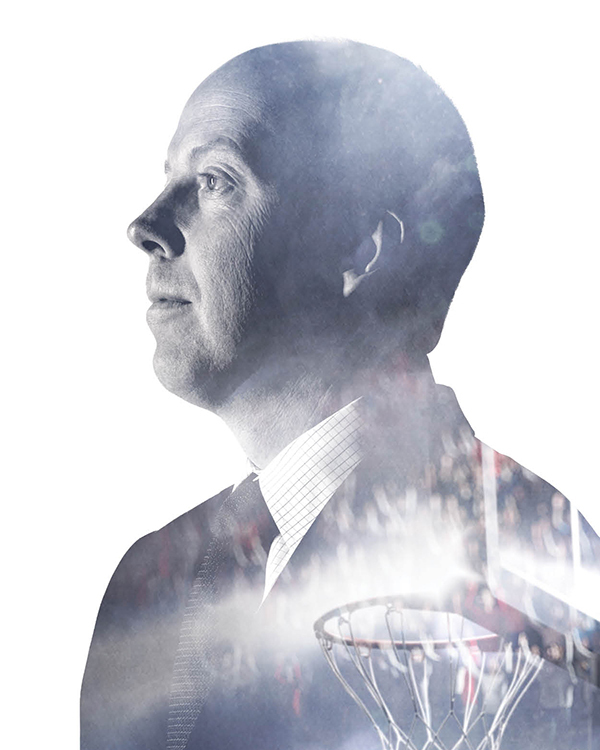 For the second time in a decade, Cronin is inheriting the Bearcats men’s basketball program. This time, however, he doesn’t have to put out a raging dumpster fire and rebuild from the ashes. It’s easy for Cronin to say that now, but there must have been impulses to ignore those warnings late last year, given the uniqueness of his position. The toxicity of the program Cronin took over in 2006 is often touched on but only partially understood. Following the melodramatic exit of Bob Huggins, then–UC athletic director Mike Thomas opted to bring on Cronin—who had rubbed some fans the wrong way when he left Huggins’s staff to be Rick Pitino’s assistant at Louisville five years earlier—rather than retain the popular interim replacement, Andy Kennedy. Detested by many fans for simply not being Huggins, Cronin was handed the reins to a program with one scholarship player, a host of NCAA academic issues (UC’s Academic Progress Rate was 838; anything below 925 could have resulted in penalties), and the daunting challenge of competing in arguably the greatest conference in college basketball history, the erstwhile Big East. Nine seasons, four consecutive NCAA tournament berths, and a few turned-down job offers later—on the heels of an American Athletic Conference Championship and Coach of the Year Award, no less—it was a cruel twist of fate that Cronin was now being advised to step down and hand over the team, his team, not knowing if he’d ever coach again. Initial reports exacerbated the public’s anxiety by incorrectly mentioning the word aneurysm, an error that infuriated Cronin and his doctors at the time. In the ensuing weeks, it was confirmed as a carotid artery dissection, which, according to the Cleveland Clinic, is a tear to the tissue walls of the arteries in the neck that deliver blood from the heart to the brain, allowing blood to leak between the layers of tissue and separate them. Undiagnosed and untreated, it can result in a stroke, and even in situations where surgery is necessary (which was not the case for Cronin), an extended period of lowered blood pressure and heart rate is integral to the healing process. Hence the mandatory rest and relaxation. Perhaps it was golfing, which probably ranks third on Cronin’s list of loves, just below Sammi and Bearcats basketball. It’s not unreasonable to imagine that it happened on the sideline, though, with the hurling of a suit jacket or the snap of his fiery gaze toward one of his players, digging his foot into the court and pointing to the millimeter directly in front of him before screaming “Get over here!” through clenched teeth. Still, Cronin can’t stop emphasizing that this was a non-coaching, non-stress related issue. This is something he needs people to be convinced of, because he’s convinced of it. And because he hasn’t slowed down. The hardest part—or at least the first thing he references as the hardest part—was when the Bearcats went on the road. “That’s when I’d be driving I-275, the whole loop,” he says, trying to keep from getting antsy. There were two or three other “hardest parts,” most notably his struggle to find a constructive strategy for watching his team play. Listening on the radio wasn’t good enough, not watching at all was a disaster, and watching with Sammi proved to be a different sort of challenge. Whatever the truly hardest part may have been, there was one big positive that came from Cronin’s medically induced coaching hiatus: “Sammi and I spent way more time together than we’ve ever been able to in January and February,” he says. And so they got through it, an unimaginable 90 days of relative calm for one of the country’s most hyperactive coaches. On March 30, 2015, Cronin’s docs declared the artery healed and at no risk for further incident. He was officially cleared to resume his normal professional life. Meaning: tee times at Traditions Golf Club in Hebron and the resumption of his infamously brutal team practices. Even during the comparably tame breakout-session practices in September, the same old Cronin is present, pacing back and forth below the basket as players run a two-lined drill of contested layups. “Power it up!” he yells, exploding off the floor as much as his middle-age body will allow, extending his arms toward the basket in a mirrored image of his players. “Power it up! Power it up!” He’s rarely a spectator in practice, preferring to be part of the show, delivering a constant stream of feedback. You can see him itching for the pulse of a live game, and with it, the occasional sideline explosion. And for good reason. It’s an odd yet much more rewarding moment: For the second time in a decade, Mick Cronin is inheriting the Bearcats men’s basketball program. This time, however, he doesn’t have to put out a raging dumpster fire and rebuild from the ashes. This time he has what could be the deepest roster of his tenure. Nearly everyone is back from a team that gave an exceptional University of Kentucky squad one of its toughest halves of the season in the tournament’s Round of 32. DeCourcy and Sporting News had UC ranked No. 18 in its preseason poll, and he couldn’t quite understand why others hadn’t followed suit. “After what they accomplished last year with what they had to go through, and with what they bring back, that more people aren’t in line with us—you don’t see a lot of top-20 or top-25 mentions for Cincinnati right now—is peculiar.” Barring another bolt out of the blue, or a complete meltdown in the first few weeks of the season, the Bearcats should by rights be undefeated heading into December—the earliest test being a solid nonconference battle at home against Butler University. It’s obvious Cronin thinks his program is on the verge of its best basketball—which is good, because to a somewhat unjust extent, it has to be. While the program is in decidedly better shape than it was 10 years ago, the long-term outlook for UC athletics is a bit cloudier. With the Big East’s demise and subsequent realignment, the Bearcats lost their position in a power conference and the TV revenue and exposure that come with it. Now desperately in pursuit of what it once had, UC is dressing for the conference it wants, pouring $86 million into the renovation of Nippert Stadium and looking to raise another $85 million to revitalize the unseemly airplane hangar that is Fifth Third Arena. The university has pushed all of its chips into the kitty, and a successful basketball program means a better overall hand, something its hometown coach is well aware of. MICK IS BACK: Coach Cronin, photographed on the floor of Fifth Third Arena, October 21, 2015. Back in his office once more, Cronin and I are staring out the triangular windows of the Lindner Center, looking down on a cluster of construction workers as they re-lay the bricks at the eastern entrance of Nippert Stadium. It’s less than a week before UC’s football home opener against Alabama A&M, and we’re each wondering if the refurbished stadium will be done in time after a record-breaking summer rainfall has set things back. Gazing out across a campus that’s practically unrecognizable from the one of his childhood, that window gives Cronin a view into the past, as well as his and the school’s potential future. Nippert Stadium is essentially brand new. The grassy hill of Calhoun Street where he played tackle football as a kid during UC’s blowout losses is now the soccer field and Calhoun Parking Garage. The house where his late mother Peggy grew up, one of the countless Corryville relics lost to UC’s eastward expansion, sat roughly at home plate of Marge Schott Stadium. 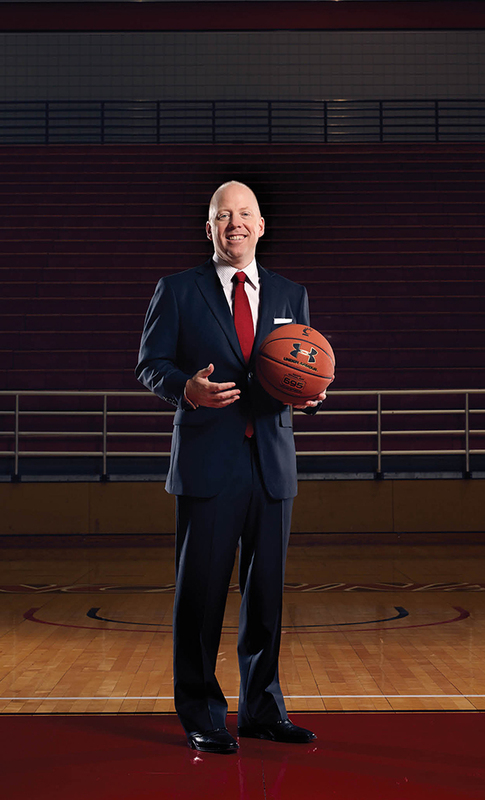 Cronin was here for those transformations, just as he has been for the changeover of three athletic directors, three university presidents, and four football coaches during his time as the head basketball coach. Enduring good seasons, disappointing ones, and a serious medical issue, he’s remained the same pragmatic, west side guy, still striving toward the same ultimate goal in the same relentless fashion. But even if he isn’t going to mellow out or change his coaching style, it shouldn’t suggest that UC’s one major constant of the past decade hasn’t been changed by this recent personal battle. “Anyone who has been through some type of health scare would tell you that you realize your mortality,” he says. “You think you’re going to live till you’re 85. You’ve got it all mapped out: I’m gonna coach at Cincinnati, I’m gonna rebuild the program, we’re gonna go on a great run, we’ll win a championship someday, I’ll retire. But something like this happens and you realize you better live day by day. “You realize anything could happen. That’s why when you have her,” he adds, pointing toward the hallway and the room where his daughter is playing. Right on cue, Sammi presses her face and hands to the frosted glass encasement of her father’s door, delivering a tangible answer to Cronin’s awakening. He’s not a better or more attentive father than he was a year ago; anyone who knows him or has been around him for the past decade will tell you that’s an area in which he has always excelled. No, it has to do with fate. Think of it this way: If Cronin had only an empty Anderson Township home to return to on the night of that San Diego State game, maybe he isn’t so inclined to take himself to the hospital. Maybe he tries to coach through the headaches, preferring to ignore the situation rather than risk giving up control and slowing the team’s progress. The Mick Cronin of 10 years ago probably doesn’t put his own health first. He’s got a team to build. Perhaps those 90 days of rest wouldn’t have even been an option. But we’ll never know, and that’s likely thanks to Sammi, a four-foot-something smile with curls. Mick Cronin did change, but it didn’t happen on the sideline, or in the locker room, or driving the I-275 loop. It happened nine years ago. And he’s only now realizing the extent to which it did. “Markers,” she says matter-of-factly, in a tone implying he should already know that. Cronin laughs, picking up his thought where he left off. “But when you have children—and you see Lauren Hill, who had brain cancer, and poor little Leah Still who has had more damn treatments than a human should have in their whole life…I had great perspective throughout the entire thing,” he says, now looking on at Sammi, who’s embarrassed to have been made the center of attention by her father once again. It’s a few minutes after 1 p.m., and Sammi’s entrance means it’s both time for lunch and for me to be on my way. Sammi looks up from the designated marker drawer she’s rummaging through, rolling her eyes in the loving way that fathers can’t fight back against. “You do it every day,” she says.